“The United Kingdom, which always wanted to colonise Maldives with the co-operation of the Athireege family, finally came to Malé in the form of the HMS Britain, on 22 Feb 1887. The captain of this ship was Rodney M Lloyd. As a representative of the Governor of Ceylon came Rear Admiral Fredrick W M Richard. Accompanying them were Athireege Annabeel Ahmed Didi, and Abdul Kareem Mudhuliar. This delegation went upstairs in the Palace and asked Sultan Mohamed Mueenudheen III, the Prime Minister Sumuvvul Amir Mohamed Rannabandeyri Kilegefaan, and the Chief Justice Naibu Thuthu to write an agreement between the English and Maldivian governments which would provide ‘protection’ to the Maldives. According to this agreement Maldives would become a colony of the English. The whole of Maldives opposed this. This proposal to become the protected servant of anyone other than the Great Allah was rejected by the Sultan, the Prime Minister, the Chief Justice Naibu Thuthu, the military, and the people. About six days later the ship returned to Colombo. There, in Ceylon, the British and their Maldivian friends arranged for Abdul Rahman Alim Sahib to write a letter of agreement in Arabic in which Maldives would become a full colony, or at the very least, a country which came under colonial authority. It was written in such a way that the Sultan seemingly requested British protection on his own initiative, and made the annual tribute ceremony the formal recognition of this new relationship. In the document, the Sultan was given a voice of abject humility, admitting weakness and an inability to stabilise the country. The delegation, this time with the addition of Abdul Rahman Alim Sahib, then returned to Malé in two large warships. The British delegation went upstairs again to Mathige. This time the document, which the Chief Justice had refused to write, had already been written and only the signing remained. The Sultan, the Prime Minister, the military, and the people… all refused. It was 78 years later, on 26 July 1965, that Maldives finally freed itself from the agreement signed, regardless of what the people wanted, on that day in February 1887. 26 July has since been marked as ‘Independence Day’. Sunday will be the 50th anniversary of the occasion. Much has changed since. At this moment in time, it is difficult to see a scenario in which, faced with a situation where parts [or whole] of the country is to be owned by a foreign party, ‘the president, the vice president, the military and the people…all refuse’. On Tuesday night, PPM submitted a motion to the Majlis: add a clause to the Constitution to allow the sale of Maldivian territory to foreign parties. The proposal was accepted and passed within 24 hours, with minimal debate, with the consent of 70 MPs. President Abdulla Yameen ratified the amendment the very next day. Public consultation was never part of the momentous decision, which has the potential to change the very identity and culture of the Maldives. Broadly speaking, there is nothing wrong with non-nationals owning land – it happens in most countries in the world. Where the Maldives is concerned, the problems are many: only two percent of its territory is land, the rest is sea; roughly 99 percent of Maldivians cannot afford to buy off the public land registered in their names; there is no independent judiciary or legal expertise to handle cases of such complexity; rule of law is emphatically absent; the corruption among government officials is unprecedented; and there is little room to expect any benefit from such sales to trickle down to the ordinary person. The natural beauty of the islands has been to Maldives what diamonds were to Sierra Leone: a disaster for the ordinary men and women; an impediment to democracy; an obstacle to human development; and a pathway to massive corruption. Most owners of tourist resorts in the Maldives are rich beyond the ordinary person’s wildest dreams; many pour their money into the dirty pit of Maldivian politics to ensure the people elected are puppets whose strings they pull in whichever direction is more lucrative for them; they help block the opening up of the tourism industry in ways that would allow more even wealth distribution; all the money they earn from tourism are squirrelled away in foreign banks, little of it allowed to go through Maldivian economic system; and, in more recent times—as a way of appeasing their ‘Muslim guilt’ for benefitting from trading in services and goods considered haram—they have been funding extremist individuals and organisations that encourage people to hate ‘the infidel’, successfully ensuring the ordinary person would not want a share of the tourism wealth. Who cares if large numbers of people are joining radical organisations like ISIS and dying in dozens? As long as they are not a threat to the tourism magnates’ personal wealth, it’s not a problem. And now, it’s not sufficient that islands can be leased as tourist resorts for 99 years that are developed with all imaginable modern luxuries while locals live on islands often with no drinking water, waste disposal systems, electricity or proper sewerage systems. It is no longer enough to have Special Economic Zones where rich foreign investors will not be subject to any Maldivian laws, the proceeds of whatever they do on these islands of no benefit to Maldivians. Now lagoons and reefs are to be sold off to any billionaire with a dredger. They will own ‘for perpetuity’ 70 percent of the land they reclaim and, as freeholds, Maldives will have little or no control over whatever happens on this new land—dug up from the bottom of the sea destroying for the sake of its existence the life that thrives underwater, the life that sustains Maldives and Maldivians. Life as Maldivians have known it for centuries is coming to an end. Running parallel to the plan to sell the lagoons and its life to the highest bidders is the plan for forced migration of the people. 60-70 percent of Maldivians are to be moved from the 200 odd islands they occupy to around two or three islands in what is to be called ‘The Greater Male’ Area’. They are all to be housed on high-rise flats built on these designated islands, families crammed into tiny little spaces like hens in a battery farm. 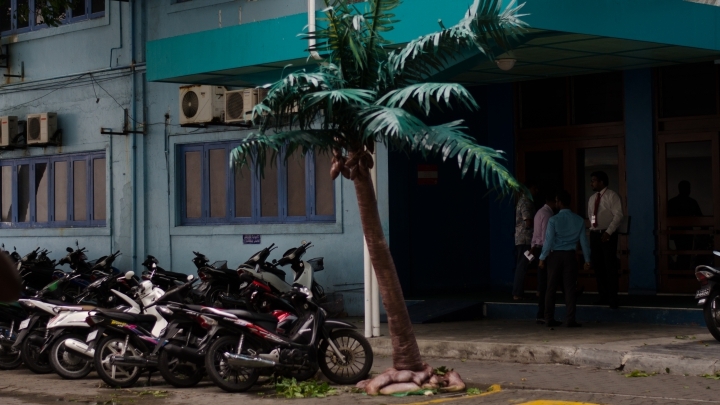 This is what has happened in Male’ already – once an idyllic island, now one of the most crowded—and often the dirtiest—cities in the world. Traditional ways of life are not just going to change as everything inevitably does; they will be forced to disappear. There have been no studies or analyses done of what the social and environmental impacts of such a migration of people will be. Such considerations are for wimps, not ‘a government with guts’, as this one describes itself to be. The consequences will be dire, but work has already begun to seduce people into thinking it is a good idea, with computer generated 3D images of a city with sky scrapers and swimming pools, vast roads and theme parks. An urban artificial ‘utopia’ a-la Singapore or Dubai. Few are asking why, when we have 1200 islands, can we not find a solution that allows the Maldivian people to live on those islands, why there are no efforts being made to provide the services they need on the islands they have existed on for centuries. No one is asking why such damage is being done to our fragile environment by dredging holes in the reef, by moving sand from the bottom of the sea from here to there, when we already have enough islands for just 400,000 people to live comfortably on. In the 21st century, where eco-friendly solutions are being invented to accommodate living life with the environment, when sustainable development is trending, where innovative scientific minds are finding ways for man to adapt to their own environments rather than the other way around — Maldives is being forced to turn around and walk doggedly in the opposite direction. Independence Day celebrations this year ring hollow. From the plastic palm trees that line the main street of Male’ (the capital island of a country where the coconut palm is the national tree! ); the fairy lights tastelessly thrown onto every available surface of the city; the Majlis’ removal of the Vice President in a political deal reeking of vengeance and personal glory disguised as a democratic ‘impeachment’; the Majlis ‘debate’ on the same night to float the idea of selling off Maldivian territory; the earlier ‘Adeeb Amendment’ to the Constitution to allow a specific person to become Vice President — it all smells of oppression, not independence. Where once state and people together resisted until left with no choice to sign agreements that would infringe on Maldivian sovereignty and identity, today only lone voices are raised even in the face of serious national security breaches—such as foreign submarines making incursions into our territorial waters for no apparent reason. Instead of guarding borders and boundaries, the Maldives National Defence is deployed to repair broken generators and, at all times, protect the president and his government. Individual freedoms have been taken away, the Maldives Police Service dispatched 24/7 to ensure the people cannot—at any time—freely exercise their rights to freedom of assembly or expression. The People’s Majlis has been turned into a place to fast-track documents loosely called ‘legislation’ that allow rulers to act with impunity, but under the legitimising veil of ‘democracy’. On Tuesday, the Majlis changed its procedural rules to say it is no longer necessary to discuss, analyse or debate a Bill before putting it to vote. As long as the ruling party has a majority, it can make anything law, without the people having a clue about what the legislation is for or what the rationale behind it is. There is no judiciary to right any wrong, to provide justice where it is required. In its place is a state apparatus designed and implemented to control society the way rulers want. All substantial opposition have been robbed of their liberty, incarcerated in jail, put into solitary confinement, or held under house arrest. Their freedom is nothing but a bargaining tool of those in control. 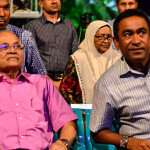 The Maldivian Democratic Party is at its weakest since inception: it voted for the Constitutional amendment that allowed Tourism Minister Ahmed Adeeb to become Vice President, and citing its position as a ‘centre right party’—a position which it has not relied on to justify much of anything to its members before—chose not to issue a three-line whip in the vote to amend the Constitution allowing sale of Maldivian property. Only a handful of MDP MPs voted against the amendment rushed through the parliament with such haste and absolutely no public consultation. MDP’s weakness is the majority’s weakness. The party has led the Maldivian democracy movement for the last decade; for a majority of its supporters, the meaning of democracy itself is ‘MDP’s vision’. And when MDP’s vision is clouded—by force or not—followers are lost in the fog, directionless, unable to see the road ahead with any clarity. As Maldives marks its 50th Independence Day, the Constitution, and the people, are both hostage to the whims and desires of the rulers. People are but mere spectators in games played among and between the rich, the elite, and the powerful. The future holds the prospects of foreign military bases on Maldivian territorial waters; becoming embroiled in Indian Ocean security issues and potential naval warfare; forced internal migration; living in slum cities; absolute loss of way of life and identity; and total subjugation to a ruthless dictatorship that will always put money before people. This article was originally published on Dhivehisitee.com. It has been republished with permission. Great article. As you are fully aware Maldives never in its history has been a country that have ever advocated for equality for all its people...from ancient times to today Maldives still hold beyflhun etc with more privileges and legal protection, resources. While I know that there are no societies or countries with total equality in the world or a place where there are equal opportunities for the poor versus rich, Maldives is definitely at the very bottom of such a list. I mean compared to northern Europeans, such as Sweden or Norway, Maldives is likely to be at the bottom when it comes giving a chance to its poor versus rich in abilities to succeed in life and have education, good health/nutrition etc. Having parents from Male, that had no land to speak of really, ie their plot which was no bigger than 40 x 40ft, makes me wonder how is it okay to have super rich foreigners be able to buy lands when local born Maldivians cant actually even claim title for these plots that their ancestors have lived for generations. When I read the laws around these plots where people such as that of my family have lived for many many generations, its clear they actually don't own the land at all... they are just living on land that belongs to government technically. The only exception to this in Male is in Maafannu ward where families that reclaimed the land from falhu to build their houses, I believe actually own the land that they live on. The strangest part of this for me personally is knowing that the house I grew up is in center of Male and my daily has lived in this area for ever, meaning that this is most likely one of the oldest places where people have lived in male ever, yet people that own these small pieces of land now (small mainly because small plots to begin with, have been divided and divided over generations to give to siblings etc) don't belong to people that live on it... I digress, I guess life is such that Maldives will always be a place where unless you are born into rich/powerful you will never have a realistic chance of leading a middle class life or something resembling that is found in the west. 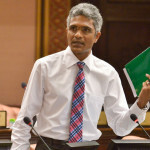 Its unfortunate that as you had explained the wealth distribution is so unequal, and unfortunate Maldivians didn't wake up to the fact that Nasheed's polices were the best for the average person...ie ability gain some benefit from tourism, a social safety net for Maldivians in the form of health care etc. I still remember looking at the plots of some of my neighbors who are resort owners today, and wondering why is they have plots so big that we used to refer their size a "falhu rah varu goathi" when my parents who didn't come from rich/powerful had such small plots... historical inequalities I guess. Ultimately I think we have all accepted that unless you are born to rich/powerful you will always need to beg from which ever the government of the day is. I guess Nasheed was the first to offer a chance out this cycle to average Maldivians. This does not in my view justify if MDP supported recent government polices just to get Nasheed out of jail, I don't think a whole generation / population should be sacrificed to the sake of one person. This is not to say that policy of having land being available for sale by foreigners is necessarily bad, but I don't believe the legislation is its current from is good. You cant put the needs of foreigners ahead of the people who elect you, so why not resolve the lack of housing and landownership for local before trying to help friends in faraway places. This amendment is only design to make wallets of the current government full with corruption money, they will take big cuts from all these investments and store that money in foreign banks and send their children to good foreign universities to get a liberal education that will make them relevant people in the world context, whereas local average Maldivian will get no benefit from this and learn the language of hate from their education system to become religious zealots. Thanks for this great article, I hope more people get to read this and possibly be available in dhivehi for those that don't read English. Thanks.